For 90 different students last year, Champ’s Cupboard provided a food refuge that helped them a total of 270 separate times. Without it, these students would have gone hungry. Champ’s Cupboard is an on-campus food bank that was started by director Laura Haffield. Haffield and student employees of the Student Life office have kept it going since 2013. Located in 245A Kirby Plaza, it is out of the way of the normal concourse traffic and is designed to be more secluded for the privacy of students. As a donation-run program, Champ’s Cupboard receives donations from sports teams, police officers, staff members and students. The cupboard is open during normal Student Life office hours Monday through Friday, 8 a.m. to 4:30 p.m., when campus is open. It provides a place where students are able to safely acquire food and toiletries such as shampoo, conditioner, razors and body wash. There are some school supplies available as well. “We’re all students, we know what it’s like not to have a ton of money,” said Jackson Gray, a sophomore who also works closely with the program: running the Facebook page. Smith and Gray, both working with the cupboard since fall of 2016, said that they work hard to reach out to people making sure the experience is casual and confidential. The goal is that students know that it is perfectly normal to use Champ’s Cupboard. Gray said that the program has seen high praise online through the Facebook page, and has been mentioned in different publications for their goals. Private messages are often sent to the group, thanking them for being available. Gray explained the extensive outreach that Champ’s Cupboard is able to have on Facebook and within the community is something he wants to expand over the next few years. 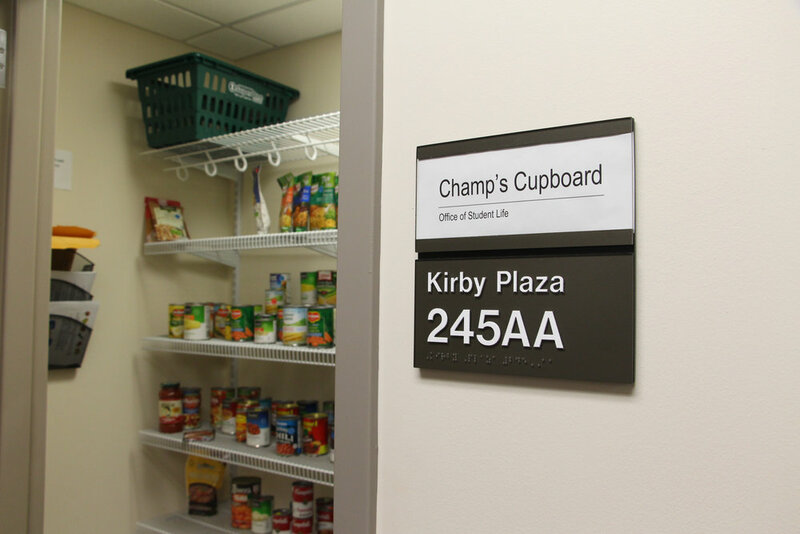 The food and supplies in Champ’s Cupboard are constantly changing based on what is donated by the public and what is popular with the students. Although the two 70-quart totes of ramen spoke for themselves, Haffield said the most popular items were ready-to-prepare meals, like macaroni and cheese, Hamburger Helper and canned meat. Students also seem to be a fan of green beans, corn and cereal, according to Gray. Recently, Champ’s Cupboard teamed up with the Office of Sustainability to create healthier recipes for students using the cupboard. The goal is to create recipes which allow students to use the supplies already available in the cupboard, limiting their need to shop to being only for perishable foods. The recipes themselves are located in Champ’s Cupboard and are available for all students no matter if they use the rest of the cupboard’s services or not. Two of these recipes include healthier ways to increase flavor, nutrients and protein to dishes like macaroni and cheese and ramen. The employees want to break down stigmas and connect a larger community behind a common issue for college students.